Police missteps may have contributed to the deaths of four Oakland, California, officers, an independent board says. Report finds 11 things Oakland police did well, 23 things that need improvement. San Francisco, California (CNN) -- Police mismanaged a shootout connected to the deaths of four Oakland, California, police officers last March, making a series of poor decisions that might have contributed to the record death toll, an independent board says. The board this week released a sometimes scathing report that paints a vivid picture of the chaos that descended on an east Oakland street on March 21 after a convicted felon opened fire on officers during a traffic stop. Lovelle Mixon, 26, is accused of fatally shooting two Oakland patrol officers and fleeing to a nearby apartment building. Mixon then allegedly shot and killed two SWAT officers who burst into the apartment before police fatally shot him. 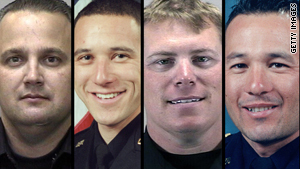 The incident was deadliest in Oakland police history, the board said. The panel, made up of law enforcement experts, said the two officers made a mistake in the traffic stop when both approached the car on the driver's side. That approach violated Oakland police training procedures and safety practices. But the report's most severe criticism focuses on how Oakland police handled the surge of 115 police cars that rushed to the scene after the traffic stop. "The activities of the 115 OPD [Oakland Police Department] and outside agency units on scene were disorganized and confused due to poor situational awareness and lack of clear command and control," the report says. • None of the highest-ranking officers at the scene took an overall leadership role in the operation, and no command post was set up to efficiently dessiminate information. "As a consequence, no one knew who was in charge, adding to the confusion and disorganization," the report says. • Police leadership violated policy by assembling a SWAT team from officers on scene instead of waiting for the official special weapons and tactics team to arrive. • A decision was made to have the ad hoc SWAT team enter an apartment where the suspect was thought to be hiding. But the building was not "formally scouted; no effort was made to ascertain the status of apartment building residents, the apartment building's interior configurations, as well as individual apartment floor plans," the report says. • The SWAT team entered the apartment without a warrant before hostage negotiators or snipers arrived. The team had never trained together and was not ready for the high-powered response it received from the gunman. The gunman shot the first two officers who entered the apartment, killing one of them. As other officers entered the dimly lit front room filled with children's toys, the officers were startled to see a woman running at them, screaming. "Surprised entry team members alerted on her as a possible shooter, but held their fire while they assessed the threat she posed as she ran yelling past them into the outer hallway," the report says. The gunman retreated to a bedroom, where he fatally shot one more officer before police killed him. The report praised the officers' restraint in not shooting the woman who was in the apartment. But, in all, the report found 11 things that Oakland police did well during the incident and 23 things that needed improvement. The report will help strengthen the police department, Chief Anthony Batts told CNN affiliate KGO. "We will correct those areas that we were flawed in. We will improve," Batts said.